Transparency Market Research (TMR) states that the leading companies in the global non-lethal biochemical weapons market held a whopping share of 57% in 2015. The dominance of General Dynamics Corporation and Raytheon Companies has rendered the competitive landscape in the overall market to be exceptionally competitive. However, BAE Systems is expected to make its mark in the global market due to the growing demand for innovative non-lethal biochemical weapons across the globe. 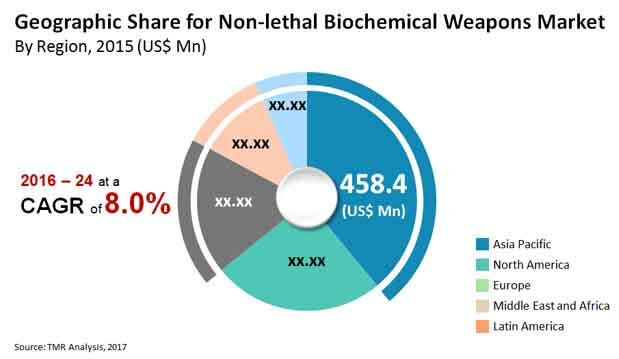 According to the research report, the global non-lethal biochemical weapons market is expected to reach a terrific valuation of US$2.32 bn by the end of 2024 as compared to US$1.17 bn in 2015. During the forecast years of 2016 and 2024, the global non-lethal biochemical weapons market is expected to surge at a steady CAGR of 8%. On the basis of product, the global non-lethal biochemical weapons market is segmented into directed energy weapons (DEW) and direct contact weapons. Of these, the DEW segment held a dominant share of 66.1% in the global market in 2015. The demand for these weapons is expected to soar in the coming years due to phenomenal developments in laser technologies and the introduction of microwave-based biochemical weapons. In terms of regions, the Middle East and Africa dominated the global market with a share of 39% in 2015. The global non-lethal biochemical weapons market has been gaining traction in recent years with swelling defense budgets. The growing incidences of cross-border terrorism and increasing political volatility across the globe are also prompting the global market to tread on the path of growth. The increasing investments in improving the military arsenal and tactics to deal with unforeseen attacks has offered the global non-lethal biochemical weapons market several lucrative opportunities. The market does have a promising future as militaries across the globe are demanding innovations in these weapons to deal with crowds without causing major impairments to human beings. The growing civil unrest in the Middle East and Africa and Asia Pacific have given the overall market a massive boost in the past few years. Militaries in these regions are seeking non-lethal weapons for peacekeeping purposes, disaster management, prevention of insurgencies, and riot control. China, India, Brazil, Egypt, Syria, and several other developing countries are expected to be key consumers of non-lethal weapons in the near future. On the flip side, the global non-lethal biochemical weapons market is expected to face a few roadblocks. The major factor likely to be an impediment in the overall market is the strong opposition from the human right activists and associations that are against the usage of these weapons. Usage of these weapons does cause damage to human life if not major impairment, which is the primary reason for human activists across the globe to campaign against them. However, the ever-changing political scenario of nations is expected to fuel the growth of this market in the coming years.